Did you know that you are entering the first quarter of 2019 for real estate? You may be thinking that was a typo since the rest of the business world would consider October to be the start of the fourth quarter. The calendar for a real estate business works differently than other business calendars due to the nature of real estate transactions. If you haven’t started planning for 2019, start now using the tips below. Thinking of the fourth quarter of the year as the first quarter is a mindset shift for real estate agents. While you are wrapping up your goals and transactions for the last three months of the year, you should be prospecting to find business for the first quarter of the year. Real estate transactions can take time to come to fruition (as every realtor will understand). It can take months for a seller to be ready for their home to go on the market or for a buyer to find their next dream home. It’s important to be creating a pipeline that will set you up for success in the first few months of the year. Most of the clients you are helping right now will not be closing on their homes until the beginning of the year, thus they will go towards your 2019 goals. Another reason why it is important to think of the fourth quarter as your first quarter is to stay motivated during the holidays. Hopefully, you have a coach or partner to hold you accountable to your goals, because the holidays are one of the busiest times of the year. It’s easy to slack off and decide not to work when you think of it as the end of the year. But isn’t it so much more motivating to think of it as the beginning and start to your new year? Planning your goals for the next year is critical to being successful. 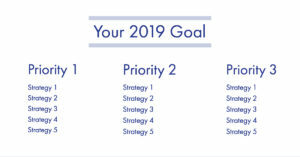 If you don’t know where to start with these goals, there are a variety of ways to plan impactful goals for the next year. 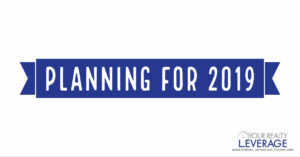 First, if you have a coach, dedicate one of your calls to planning for next year. Your coach will ask you insightful questions about your goals and will be there to hold you accountable. If you don’t have a coach, reach out to the Team Leader, Productivity Coach, or a top producer in your office. Ask them to help you set realistic and challenging goals. Secondly, make your goals SMART – Specific, Measurable, Achievable, Relevant, and Time-Bound. Ensuring that they follow those guidelines will be necessary for your success. Lastly, create a 1-3-5 for your goals. The 1-3-5 is a tool that was created to ensure you stayed on track to meet your goals. It breaks down your ONE goal into THREE priorities that will be accomplished by FIVE strategies. If you have a team, this is a great exercise to do with the team! Many teams will plan an entire day to review their goals for the next year. This is a fun way to get buy-in from everyone who will be participating. It is also a great opportunity for you to reward the team for a job well done in the previous year! To reward the team, have lunch catered in, plan a fun outing, or give everyone a nice gift. A small reward will likely go a long way and inspire the team for what is coming in the new year. In the planning portion of the day, have the team give their input into the 1-3-5 by using a flip chart or dry erase board to write down their ideas. After taking some time to brainstorm, narrow it down to five strategies per priority. A team planning day is also an opportunity to ask the team what they feel is going well and what they feel could be better. Be open to the answers and feedback and create plans to make the changes suggested. We would love to hear your ideas for team planning days and planning goals for 2019! What do you do?